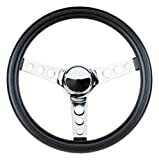 Found 26672 Steering Wheels Products. Car model: Universal Fitment: Fits most cars & vehicles with 6-bolt hub adapter. Dimension Diameter: approx. 14"(350mm) Grip thickness: 1"(25mm) Depth / Dish : 1.75"(44mm) Hole: 6 Spec Main material: wood Spoke material: iron Finish for spoke: mirrored chrome spoke This item is 100% NEW Warranty 1 year NOTE: -Made of the iron spoke and wood composite steering wheel. 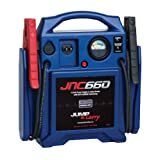 -Comes with 6x bolts, Allen wrench and horn wiring for installation. -Accepts all standard 6-bolt hub adaptor kit ( Momo, Sparco, Nardi, etc ). -Hub adapter is not included. -All kinds of steering wheel come with the horn. 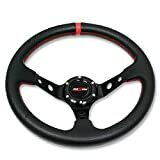 This is a brand new 320mm (12.5") 6 bolt pattern f1 style sport racing steering wheel made by red/black pvc leather. This racing steering wheel gives your car a stylish racing interior. Besides giving your car a racing touch, this steering wheel also provides better grip and handling. 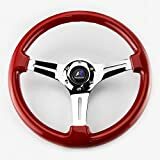 This steering wheel has a 6 bolt pattern design for mounting, and therefore you will need to purchase a steering wheel hub adapter separately in order to install this item. Steering wheel hub adapter is not included with this package. This wheel features Grant's exclusive dual-plane spoke design. 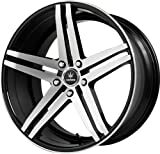 This 3-dimensional hi-tech, dual-plane 4-spoke design offers a "world class look."" A Grant Installation Kit is necessary to mount this wheel to a vehicle. This wheel will work with any Grant Standard 3000 or 4000 Series Installation Kits. It WILL NOT work with Grant Billet or Euro Installation Kits. Note: The eight bolt pattern you see around the horn button is decorative only and this wheel is still a three bolt pattern beneath the horn button. This is a 15 inch Middle size steering cover. 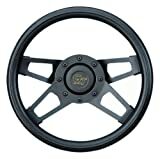 It fits 90% steering wheels with outside diameter of 14 1/2 to 15 inch. Important:Please refer to the last picture to see whether our Middle size steering cover fits your car. If you are still not sure whether this steering cover fits your car, please tell us the model of your car in the Customer Questions & Answers part. We will check the steering wheel diameter of your car in our database and will reply in 12 hours. Thanks a lot! :) Decoration and Protection: Hide existing wear and keep your steering wheel looking new. Luxury Comfort: High quality microfiber, soft padding, breathable, anti-slip and massaging design. 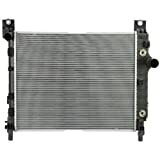 Durability: Heat resistant, cold resistant and wear-resistant. Increased Safety: A better grip on the steering wheel gives you more control on the road. Green Material: Our products are totally eco-friendly and healthy. Money-back Guarantee: We are proud of our products and services. If you are not satisfied with our products, we offer you Return or Exchange or Refund. Founded by two electronics engineers in 2006, Rueesh Technology has been devoted to designing and supplying high quality automobile accessories to distributors and customers around the world. In Rueesh, only high quality, healthy and eco-friendly raw materials are chosen for manufacture. Advanced manufacturing techniques have been developed and applied. All the production processes are under strict quality control to ensure quality stability of our products. This item will only work with 6 bolt steering wheel hub adapter. This wheel will NOT work if your car does not have a 6 bolt steering wheel Hub Adapter that is specifically made for your car. Hub adapter is NOT included. This is a brand new 350mm. 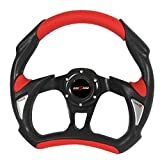 6 bolt pattern f1 style sport racing steering wheel made by red/black PVC leather. This racing steering wheel gives your car a stylish racing interior. Besides giving your car a racing touch, this steering wheel also provides better grip and handling. This steering wheel has a 6 bolt pattern design for mounting, and therefore you will need to purchase a steering wheel hub adapter separately in order to install this item. Steering wheel hub adapter is not included with this package. 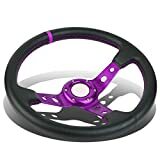 One of our most popular aftermarket steering wheel offers outstanding quality and a sleek design with interchangeable half wrap colors of your choice to match your vehicle/style! This wheel is 13 3/4 inches in diameter and crafted from forged aluminum. The dish is 1.75 Inches deep and the bolts are 1.6 Inches apart center from center. 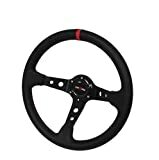 This steering wheel includes a half wrap and a plain horn button. An installation adapter is not provided with this steering wheel. In order to mount the steering wheel to your steering column you will need to purchase an adapter with a 5-bolt pattern. That's right your looking at the Grand Daddy of them all. 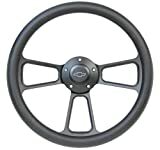 The famous 838 wheel was the first design wheel ever made and it is still our number one selling wheel! It's Classic features of three holes per spoke and an extra thick foam cushion grip make for a huge slice of comfort and class on any ride. This wheel is so famous it has its own Twitter Page! Just kidding! But seriously this wheel is the real deal! A Grant Installation Kit is necessary to mount this wheel to a vehicle. This wheel will work with any Grant Standard 3000 or 4000 Series Installation Kits. It WILL NOT work with Grant Billet or Euro Installation Kits. ChuLian Diamond Steering Wheel Covers Fit Most Middle Size Steering Wheels With Outer Diameter of 15",Suitable for Most Car Steering Wheels. 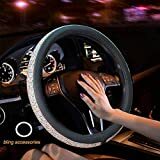 Description: Material: High Quality PU Leather With Rhinestone Size: Universal Fit For Steering Wheel With 38cm/15 inch in Diameter Weight: about 0.6kg/1.3lb Package Included: 1 x Diamond Car Steering Wheel Cover Features: -This soft car steering wheel cover is easy to install and support most standard car steering wheel up to 15 inches,please measure the steering wheel before purchasing. -All seasons use,comfort grip feeling,durable and heat or cold resistant and wear-resistant. 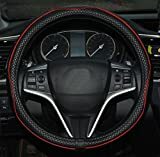 -Durable: This car steering wheel cover is lightweight,strong,classy,and has great touch feeling. Adds luxury into your car interior. -Fashion Design,Bling under the light: sparkling through windshield and shining your car. Perfect for women and girls. -Better comfort: Breathable,soft padding,contour shape and massaging design. -The perfect product to get a better and safer grip while cruising around on the road. The fashion design makes your car more luxurious. 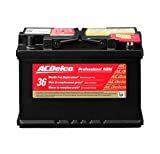 -If Its difficult to put it on at first time,because it has kind of hard rubber coating inside,you can heat it up a little under the sun to soften the rubber then put it while its warm. Its easier to stretch it a little. Install Instruction: -1.Put the steering wheel cover on the top of steering wheel. -2.Pull tight the steering wheel cover from top to side. -3.Keep pulling tight the steering wheel cover from side to bottom. -4.Fix the bottom of steering wheel cover and adjust it.